The distinctive feature which has bestowed upon the American Curl cat its charming, unusual name as a breed is deemed to be a spontaneous mutation which came to the world's attention in June 1981. • On a hot summer day, two stray long-haired cats, both with strangely curled ears, appeared at the home of Joe and Grace Ruga in Lakewood, an instant city developed in the 1950s in California's Los Angeles County. • After a few weeks, the black-and-white kitten, named Panda by the Rugas, disappeared, but all-black Shulamith remained. Shulamith became the foundation female for a new breed, which was given the name of American Curl. • Within six years of Shulamith's appearance at the Rugas' door, the breed received unprecedentedly rapid recognition, in 1987, from The International Cat Association. • In 1993, the American Curl breed was recognized with Championship status by the Cat Fanciers Association. The unusually swift rise of a stray to feline stardom is a charming equivalent of a rags-to-riches tale in the feline world. For those familiar with this amiable, playful, medium-size breed, the ascent is well-deserved. On a hot summer's day in June, 1981, feline history experienced an enigmatic pounce as two strays sought shelter at the home of Joe and Grace Ruga in the instant city of Lakewood, newly developed in the 1950s in California's creative mecca, Los Angeles County. The black-themed long-haired female kittens both evinced the startling feature of ears which curled strangely backward. The Rugas gave the name of Panda to the black-and-white kitten. For the all-black kitten, they chose the name of Shulamith (Hebrew: שולמית, derivative of שָׁלוֹם, shalom, "peace"), inspired by Shulamit, the "black and comely" female in "Song of Songs." Two weeks later, Panda disappeared, but "Shu" remained. In December 1981, Shulamith gave birth to four kittens, two of whom had curled ears. Cat specialists attributed Shulamith's signature feature of curled-back ears to a spontaneous mutation. The ear-curling gene was deemed to be autosomal dominant, that is, inheritable even with only one gene. Selective breeding programs were quickly put in place in order to preserve the fascinating physical trait of this new breed which would be named for its hallmark, American Curl. Breeding with domestic cats has ushered in a wide gene pool, which, in turn, promotes the breed's well-being. January 1984 marked the first Curl-to-Curl breeding, from which the program's first litter was birthed in March. Acceptance of the new breed occurred swiftly. In 1987, only six years after Shulamith wandered so unassumingly onto the world stage, the breed of American Curl received recognition from The International Cat Association (TICA), the world's largest genetic cat registry. Five years later, in 1993, the Cat Fanciers' Association (CFA), the world's largest registry of pedigreed cats, honored the breed with Championship status. In addition to their adorable faces, which are framed so enchantingly by their unusual ears, American Curls abound in attributes. Their amiability extends to children as well to other pets, both canines and felines. Their bodies tend toward a rectangular shape. Their attractive, silky coat lies flat as either long-haired or short-haired lengths. Their minimal undercoat results in scant shedding and minimizes grooming. Coloration and patterning exhibit great variation. Their expressive eyes tend toward a walnut shape. Lifespan averages at 13+ years. Their mews resemble little trill-like cooings. Playful personality endures throughout their lifespan. Weight of this medium-size breed ranges from five to 10 pounds (2.2 to 4.5 kilos). Attention always ends up focusing on the breed's smile-inducing ears. At birth, their ears appear straight, but in less than a week a tight, rosebud curling appears which then slowly unfurls, for the duration of about four months. American Curl cats are classified as pet or show, according to curling angle. Some ears exhibit little or no curling. The degree of curling must trace a graceful arc of 90 to 180 degrees to qualify as a show feline. 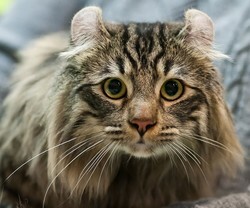 Long-haired varieties sport long tufts which fan outward across their ears in a styling reminiscent of those of the lynx. Thanks to a wide gene pool, the breed evinces no inherited defects, although care must be taken in cleaning American Curls' ears, for the cartilage may be damaged if force is applied or if folding is attempted. fifteen Grand Champion offspring from the father (sire). American Curl cats are desirable felines. Perhaps their whimsical ears betoken their exemplary temperaments and outstanding health. This is a breed inclined toward amiable, intelligent, loyal camaraderie in family life. Their sociability guides them toward problem-free interactions with all ages of humans and with other pets, including dogs. When they enter into a full household, they show respect for occupants' seniority in living arrangements. American Curls make themselves welcome wherever they find themselves. The Cat Encyclopedia: The Definitive Visual Guide. London, New York, Melbourne, Munich, and Delhi: Dorling Kindersley Limited, 2014. Robinson, Roy. "The American Curl Cat." Journal of Heredity, Volume 80, No. 6 (1989): 474–475. Robinson, Roy. Genetics for Cat Breeders. Second edition. Oxford UK: Butterworth-Heinemann, 1991. Soffer, Ruth. 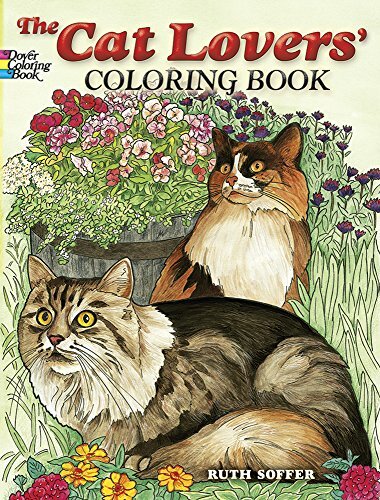 The Cat Lovers Coloring Book. Dover Pictorial Archive Series. Green edition. Mineola NY: Dover Publications, Inc., 2007. Vella, Carolyn M., and Lorraine M. Shelton. Robinson’s Genetics for Cat Breeders and Veterinarians. Fourth edition. Oxford UK: Elsevier Limited, 2003. 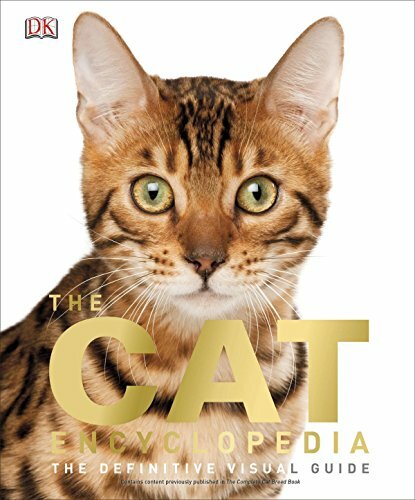 Offers everything you need to know about cats in one easy-reference volume. Features stunning photographs of cat breeds from around the world combined with expert advice on kitten and cat care, and a celebration of cats in art and culture. "I'm Purrfect just the way I am"
The Cat Lovers Coloring Book (Dover Nature Coloring Book) by Ruth Soffer ~ excerpt: "American Curl cats are easy to recognize because of their unusual ears." The world's top cats are represented in thirty lovely, lifelike illustrations. iggy, Cats won me over, too! I agree: American curl cats have cute ears. I became a cat person when Sassy came into my life and taught me they have big personalities. The ears are cute on these cats. WordChazer, "Screaming humans": sad but true and seems to be getting worse! Kittycat babies are so adorable. I love the way that they're lighter than air. 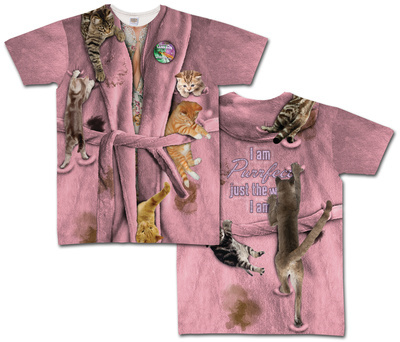 Cats enjoy a lifelong adorability, from kittenhood through cathood. "And talk in mews": yes! such a charming language. I agree, Dee. I'd much rather have a world populated by cats and not so many screaming humans. Had altogether too much of Everyone Else's Babies this week...the only babies I'm interested in have four paws, a tail and whiskers. And talk in mews. WordChazer, That is awful! Ingestion of antifreeze is supposed to bring about a horribly painful death. That is cruelty to animals, which is supposed to be a common trait in serial killers. I hope that the cats in your area are able to band together and elude those nasty people. I especially admire the bravery of strays, putting one paw in front of the other, no matter what, despite their shortened lives from exposure to the elements (which, incidentally, affects their mewing) and mistreatment by humans. WordChazer, Do you have any idea of the reason for so many animals "going missing" thereabouts? That is scary, indeed. It's sad to see those "Missing" posters. I don't think I'd dare have a pedigree cat around here. The numbers of animals going missing is scary, and one as unusual as an American Curl would definitely atract the attention of the wrong type of person. burntchestnut, American Curls seemingly came out of nowhere, and, despite their rapid acceptance in the hallowed halls of cat registries, they have retained a widespread anonymity among the general public. I've never heard of this cat breed before. How interesting! Kinkajous are energetic extroverts as exotic pets. They delight foster families by devouring insect pests. They dismay human friends by raiding garden fruits and vegetables. Spots and stripes act as camouflage. They also advise of scented communication and defense. Why else do Africa's and Eurasia's common genets have spotted bodies and striped tails?